You must have noticed the heat coming from an engine if you ride a motorcycle or monitored heavy / large diesel engine. Where does this heat come from? Heat is produced in cylinders during the power stroke of an engine. While most of that heat escape the cylinder in form of hot exhaust gas; some escape through conduction across its walls. While most metal conduct these heat to later radiate outside to atmosphere; but there is only a limit to which a metal can radiate heat based on its surface area. If the heat radiated outside of the cylinder is much less than what left inside; the engine can become overheated. Prolonged overheating can results in uneven thermal expansion of engine parts, corrosion and thermal stress. So an engine cooling system is installed in I.C engine to ensure efficient performance of an engine. An engine can be cooled either by air or water and are called air cooled and water cooled system respectively. An air cooled system can either use forced cooled system or maximize heat exchange naturally by increasing its surface area. On other hand a water / liquid cooled system can use radiator or dedicated heat exchanger in a closed loop system. Irrespective of the method their main job is to keep engine temperature under control. High engine temperature not just cause deformation, distortion, thermal stress and piston seizure; but also reduce the volumetric efficiency of an engine with high risk of cylinder parts to melt down. The main work of a cooling system is to reduce the excess heat generated in the cylinder. It should not reduce the waste heat much less or more; otherwise leads to negative effect on the engine performance. 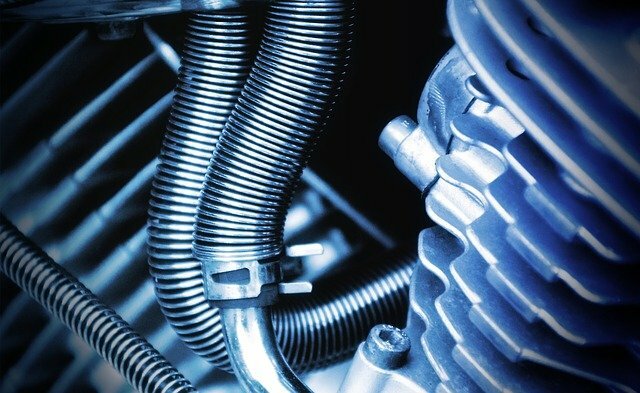 So it is a thumb rule to install an engine cooling system which can reduce excess waste heat up to 30%. Thus different types of cooling system is installed on different engine which can meet up the 30% requirement. The image represents air cooled engine with extended surface area in form of fins. Small engines with relatively lower power output in comparison with heavy engines tends to have air cooled engines. They are generally used in motorcycles, small tractors, scooters, very small engine and propeller aircraft’s. These engines are relatively cheaper, easier to construct and light in weight. Above all they require much less maintenance or monitoring and are not affected by temperature difference and sub zero temperature. In fact these engines are preferred over others in arctic region due to water scarcity and sub zero temperature. Air cooled engine cooling system works on this simple principle of effects of air velocity and surface area on heat transfer between two medium or body. When two bodies or medium solid or fluid are in contact heat is transfered from the one with high temperature to the low temperature medium. Heat is first transfered from cylinder to its walls and then is taken away by air by the means of natural convection. The walls of cylinder heats up the surrounding air; hot air tends to rise up making space for the cool air to fill its place and continue the process. Thus through the process of natural convection air cooled engine cooling system works to reduce most of its waste heat via convection; while some manage to escape through the process of radiation. But still it is not enough even for an small engine as such in motorcycle to provide efficient cooling for prolonged time. In order to cool efficiently it should remove heat successfully at a faster rate. Thus to achieve higher cooling efficiency for the same engine forced convection method is used. An additional fan is mounted on the engine shaft in this process to provide additional air flow. While its relatively easy to install an additional fan on the engine shaft to provide more cooling air to speed up the process. We can achieve similar results even with natural convection by increasing area of the cooling surface. To do so small engines as such in motorcycles have these extended surface in form of fins. These fins provide extra surface area thus increasing the rate of cooling process. Together with passing air and extended surface area in form of fins; these air cooled engines tends to do its job perfectly. A large part of engines that we see in automobiles and industries are in fact water cooled type. They are in our bus, car, trucks, tractors, alternators, industrial engines and even on ship; as in marine diesel engine. These water cooled engine can be easily identified by its distinguish parts such as; radiator ( a type of heat exchanger ), expansion tank, cooling fan, water pump, thermostat, bypass valve, cylinder jacket and pressure cap. These water cooled engine have water flowing from bottom to top in cylinder jacket with water flowing in series to the cylinder head. This means that the some what hot water after cooling cylinder goes to the cylinder heat and to exhaust valve based on design. This is done to avoid thermal shock and stress to the cylinder head and its parts; due to greater temperature difference between water and the cylinder head. While water is used to cool solid parts such as the head and the cylinder; but moving parts such as piston rely only on lube oil for their cooling. Based on its design a water cooled engine can be classified into three major categories; closed loop, open and semi closed engine cooling system. An open cooling system is used in places with unlimited supply of water as such in small motor boats and yacht. It is a cooling method of an old times popular during and after the second world war. 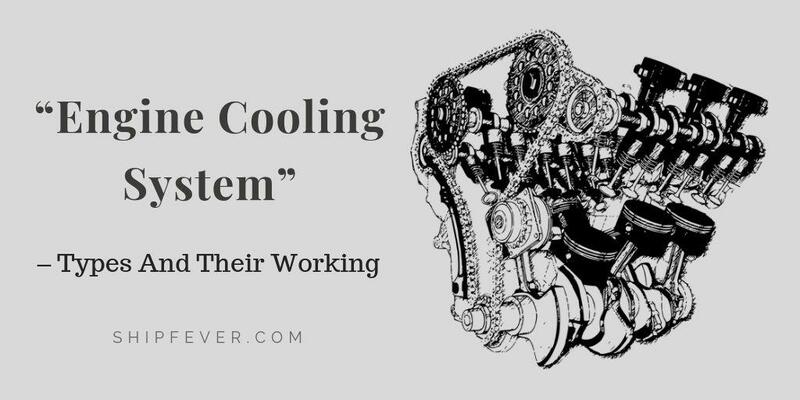 A closed loop cooling system is used in shore based industries and automobile engines; where a fixed type of coolant is used over and over again. On other hand a semi closed type engine cooling system is used currently in large commercial and military ships. Here a fixed type of coolant is used in a closed loop; which is continuesly cooled by sea water flowing in an open system. That means sea water is pumped in to cool the hot coolant and then discharged overboard. Let’s assume that your car resting in your garage with its engine cooled down. 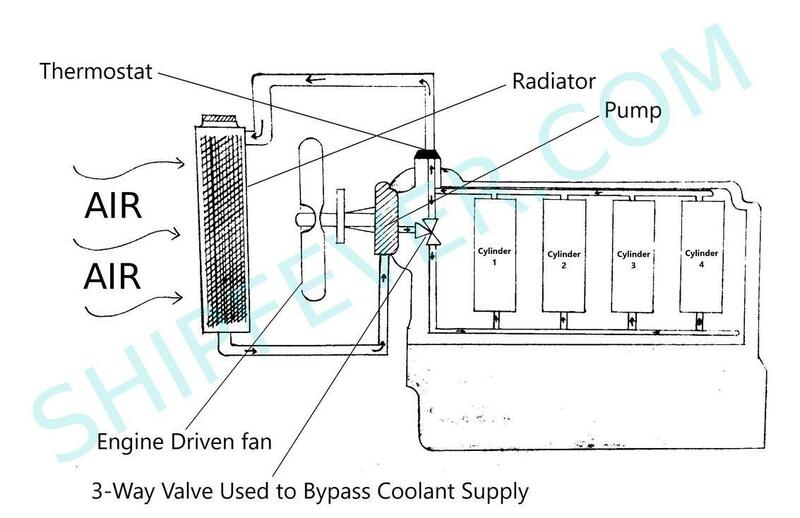 With Input and output hoses of the coolant pump connected to the radiator and cylinder jacket; it is ready to be used at any time. A thermostat is fitted in between the coolant return and the radiator inlet to control engine temperature. Now when you start the engine; the thermostat blocks the coolant flow back to the radiator using a bypass / stop valve. This is done to assist engines to gain its working temperature quickly. Once the engine reach its normal working temperature; thermostat open the valve to allow coolant to flow across the radiator. The coolant enters the engine through the jacket water inlet and move towards the cylinder head. Special boors are made within the cylinder metal for efficient heat exchange. The coolant pickups the waste heat as it moves across these passage in cylinder block and its head. It then return back to the radiator to cool down. The coolant enters the radiator via radiator inlet ports to flow down the radiator tubes. Heat is exchanged between the coolant and the cool air in these radiator tubes. The air flow through these radiator tubes by the action of vehicle forward motion. Additional engine or motor driven fans are installed to provide extra air flow to assist heat exchange at slow speed. Many water cooled engine have this additional feature of auto cut in and cut out for their radiator fans; to avoid unnecessary forced air circulation. An additional overflow or expansion tank is provided to avoid radiator tubes from being pressurized. When the engine is running for too long and at high rpm; its working temperature goes up. This results in more waste heat production and thus warmer coolant temperature. If remained unchecked this can results into excessive pressure condition in radiator tubes. 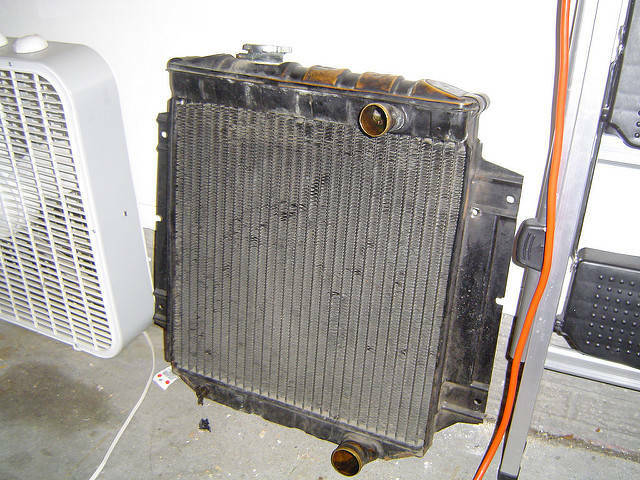 This can be fatal and leads to bursting of radiator tubes or total radiator failure. To avoid such situation an overflow / expansion tank is provided in the system. When temperature increase the coolant expands and overflow in the expansion tank rather than creating pressure. At times when the temperature reduce or there is an loss of coolant in the system these overflow tank helps to maintain proper coolant amount in the system. This is the reason why its considered a good practice to at least half fill the radiator expansion tank before a very long drive. One of the most simple and efficient engine cooling system; the open loop water cooled engines are used for small marine crafts such as motor boat and jet-ski. Some custom fitted small fishing boats too have open loop cooling system due to low cost and simple design. Its really simple to construct, operate and maintain as its all about sucking sea water to flush the engine jacket. An open loop system is preferred over others where the demand for coolant is too high, simple operation is needed with a much lower price tag. In an open loop engine cooling system the water is sucked in by a pump through a series of strainer. The output of these pump is given directly to the jacket inlet and is circulated around the cylinder. The hot coolant water is then directly thrown overboard. It was the cooling system most used in the last century. But considering its disadvantage such as corrosion, marine deposits and high risk of oil pollution; it is restricted to only a handful of marine application. Fresh water is used to cool marine diesel engine which is then cooled by continues flow of sea water in a semi closed system. It’s one half consists of fresh water system working in a closed loop to cool cylinder block, cylinder head, turbocharger and exhaust valves. The other half consisting of sea water is used to cooling medium for the fresh water in a open loop system. Fresh water is used in engines to avoid corrosion and poor heat transfer due to salt deposits. Fresh water for this purpose is produced on ship by the fresh water generator. Sea water is pumped into the heat exchanger called jacket water cooler; where it takes the excess heat from the fresh water. The sea water pump take suction from one of the sea chest on port or starboard side of the ship; via a set of suction valve and strainer. The output of these pumps are given to various systems including jacket water cooler via a non return valve. Each ship have two of such pumps with auto changeover facility. The jacket water after cooling cylinder jacket, cylinder head, exhaust valve and turbocharger returns back to the jacket water through a self regulating thermostatic valve comes to a heat exchanger. On board ship there can be shell and tube or plate type heat exchanger as the jacket water cooler. The two liquid fresh and sea water is flown at opposite direction to each other to increase the rate of heat transfer. So if the sea water enters from top and leaves from bottom; the fresh water will enter at bottom and leaves from top of a heat exchanger. The jacket water temperature in marine diesel engine is maintained at 75 degree Celsius using a bypass valve and thermostat set at temperature in between 75 and 80. By pass valve is open with the jacket water restricted to go to the heat exchanger till it reach its optimum working temperature. If the temperature of jacket water is too low to start the engine it is passed through heating or steam coils. Once it reach its working temperature bypass valve is half shut and thermostat allow the water to go to the jacket water cooler. Water expands exponentially when they freeze. So freezing of cooling water in an cold engine can damage the valves and its connections bending and rupturing small passages. This not only restricts one to use an cold engine but also pat heavy cash on its repair in summer. 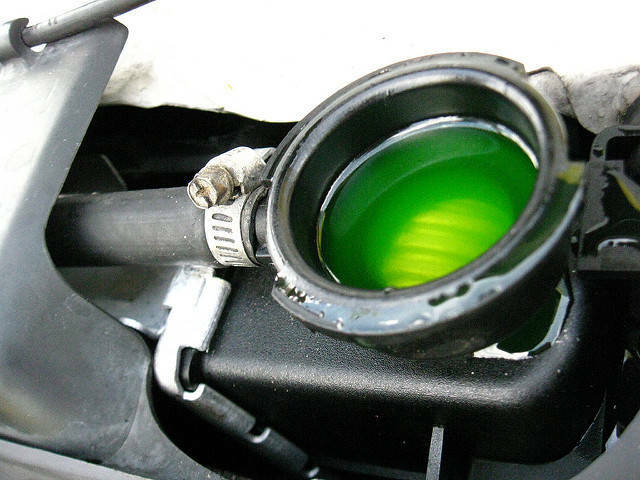 To tackle such problem of freezing water in winter an compound called antifreeze is mixed with the water. The compound further lower the freezing temperature of the jacket cooling water avoiding it to freeze. Generally a ratio of 70-30 to 50-50 is used in the automobile industry. But for some case as with engine specially designed for polar reasons have this ratio as high as 30-70. This means thirty percent water and seventy percent antifreeze compound. It is an common practice to use ethylene glycol and polypropylene glycol an antifreeze compound. They are chemically stable, have very low freezing temperatures, have very high boiling temperature, does not evaporate radially at room temperature, is durable with a dangerous quality of being poisonous.